Ever since I reviewed Rise of the Storm by fellow Weekend Writing Warriors author Christina Ochs, I've been eagerly awaiting the sequel. I'm not really sure what I expected throughout Valley of the Shadow, the second book in her Desolate Empire series, but Ochs did not disappoint. Rise of the Storm is rich, compelling, and epic. Valley of the Shadow is the same, amplified a hundred fold. I was expecting a lot of drama spread over a huge expanse of time (I'll get to why this is awesome later), but I wasn't expecting to be hit with some serious emotion that pulled on my heartstrings with ruthless force. 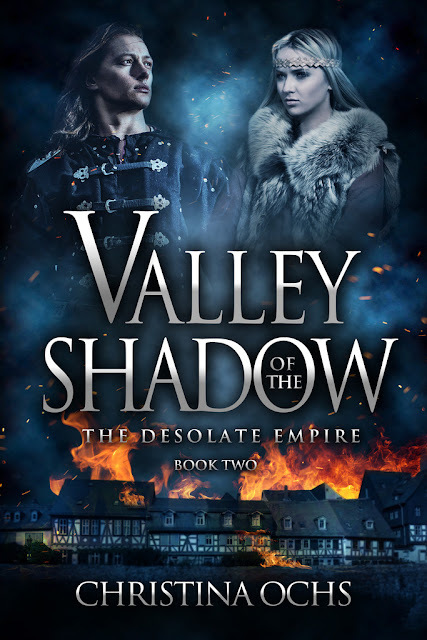 Valley of the Shadow might be a little slower than most books I read (not a bad thing, and only mentioned because I tend to fare with non-stop action urban fantasy), but it held my attention from beginning to end. Especially at the end, if I'm being honest. What a cliffhanger. Yikes. Since this is a sequel, I'm going to post a minor spoiler warning. There are a few things I wish I could talk about, but I'm not one to give away massive spoilers like the ones I suffered in Valley of the Shadow unless I can't avoid them. So if you only want my recommendation on whether you should read these books or not, to you I say, "What are you waiting for?! Do it now!" Gorgeous cover that definitely carries weight in the novel! A captive prince. A desperate princess. An alliance that will shake the foundations of an empire. In the wake of battle, Kendryk finds himself the prisoner of Empress Teodora. As war ravages Terragand, Kendryk’s guilt is matched only by his fear that he will never see his family again. Gwynneth, in possession of a valuable captive but sworn to keep him close, faces Teodora’s wrath as she waits in anguish for relief. But when Gwynneth’s rescue comes, the empire will never be the same again. A tide of religious upheaval sweeps across the land, bearing men and women toward their fates. The delicate joy shared by Janna and Braeden will be shattered; the king of a neighboring kingdom will walk the edge of madness; and an oath of vengeance will bind three unlikely allies together in a desperate attempt to curb Teodora’s ambitions once and for all. The story picks up close to the end of Rise of the Storm, with Kendryk suffering from his injuries while the rest of his allies struggling to find a way to defeat the truly wicked empress Teodora. As much– and as easy– as it is to despise Teodora, the story is also told from her side and the side of her soldiers. Since this is a story about war and everything that comes with it, events take place over the course of several years. While there were some points where the waiting was excruciating, especially for Kendryk, it helps prove that this isn't a simple matter that can be resolved. Both sides will make sacrifices to form alliances that could prove to aid or hinder their efforts. Betrayal is prevalent, and by the end of the book, it's clear that almost no one can be trusted, through past or present transgressions. But it's impossible not to love the characters that Ochs are all well developed and three dimensional. They have flaws and vulnerabilities, as well as traits that make you adore them. While I've always enjoyed Kendryk, I have to admit that he made me a little insane in his first few chapters. He had a bit of a death-wish thing going on, which made him impossibly stubborn and frustrating since he has never been that way in the past. Gwynneth is stronger than ever, growing past her mistakes and easily becoming one of the strongest women in play. Orland had a nice transition, though it wasn't pleasant for him, since he spent a lot of the time drinking and scraping the bottom of the barrel to get allies to fulfill his quest. Anton did a lot of growing as a boy, and I was amazed at how brave he was. Janna was as lovely as ever, and Braeden was as wonderful as he'd always been, though the shift in his story became darker and more heartbreaking than I could imagine. Arryk probably had the most growth of everyone in the book. He started out as a young prince intent on helping his sister, became King, fell in love, then watched it all fall apart. I'm interested to see what happens to him in the third book. Even Teodora had moments where I had to sympathize with her. Let me be clear– I loathe Teodora. In Rise of the Storm, she was a temperamental b*tch, but I never truly grasped how diabolical she could be until Valley of the Shadow. She really is a monster, but as with any well-written character, Ochs makes sure to remind us that Teodora is a human that wants to be loved like any other human. That in turn makes her own setbacks disconcerting, and while you don't want to feel sorry for her, you can't help but think "If this had been different, or this had happened, maybe she wouldn't have been this way." There are no end to shocks and surprises in Valley of the Shadow. In fact, there were some points where I had to re-read sections just to make sure I read them right. I almost never do that. The shocks with Janna and Braeden stunned me the most. Literally stunned. They're my favourites, and I definitely felt my heartstrings being yanked at more than one point. And that end chapter... of all the things that I could have imagined happening, that was the last. Yikes. The story itself is told at a steady pace. A lot of the action comes not from battles, but from the relations between the characters. They drive the story and have always been the highlight of this series for me. I eagerly wait for Ochs's entries on Weekend Writing Warriors, just to see who she picks for her next snippet. This sequel was absolutely wild, and I have no clue what will happen in the next book, though now I understand that nobody is safe. A highly recommended read to all fantasy lovers, especially if you enjoy Game of Thrones. Do not miss out on this one.